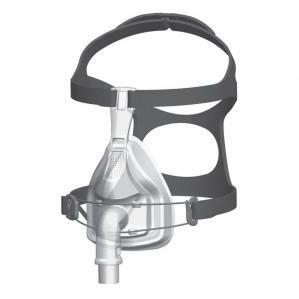 Fisher and Paykel continues their unique "Under Chin" design with the new FlexiFit™ 432 full face CPAP mask. Like the FlexiFit™ 431, the full face cushion fits under the chin rather than up against it. And the FlexiFit™ 432 adds an inner foam cushion for better fit and stability. Its Under the Chin design is good for holding up the jaw and sealing over some beards. A soft inner foam cushion has been added to the silicone cushion for a better seal, stability and comfort. It helps fit a wider variety of bridge sizes and shapes. Same Glider-Strap technology as other Fisher & Paykel masks to stabilize mask while moving.